Are You Ready for SSD? I've written about solid state drives before, but here's a quick summary. SSDs are an alternative to the standard magnetic, spinning disk hard drives we've all been using for decades. With no moving parts, an SSD offers more speed, greater reliability and decreased power consumption than magnetic drives. As I mentioned in the intro, SSDs are getting bigger and prices are coming down. But we've hit a technology speed limit. The speed bump is due to the 6 Gb/sec limit of the latest SATA III interface. SATA III is the current state-of-the-art in consumer-grade I/O interfaces, the type found in most affordable PCs. Sure, PCI Express-based SSDs are even faster than SATA III, but they cost thousands of dollars and, as such, are found mainly in servers and high-end workstations. For the foreseeable future, 6 Gbps is as fast as most SSDs can go, and that's actually a good thing for consumers! With speed stalled, SSD makers are competing on price and capacity. It's no longer hard to find an affordable SSD that will serve as a main storage device. Take, for example, the Intel 530 series of SSDs, with capacities ranging from 80 to 480 GB. The 240 GB model has a maximum read speed of 540 MB per second and a maximum write speed of 490 MB per second, which is enough to saturate a SATA III interface. The lowest price I found online is only $169. The 480 GB version runs about $350 or more. Not cheap, but within the realm of possibility. Intel also offers a five-year warranty, compared to the typical 3 years. The OCZ Vertex 4 is another capacious speed demon. Its capacities range from 128 to 512 GB. Maximum read speed is 525 MB per second, while write speed tops out at 200 to 480 MB per second. It should be noted that SSD speeds increase with capacity, generally speaking. The 240 GB version of the OCZ Vertex 4 goes for $159 online. Other SSDs that can max out the SATA III interface pipes include the Corsair Force and Neutron series , Kingston's ssdNOW and HyperX, Patriot Pyro. Street prices for SSDs have fallen over the past two years and are now under a dollar per gigabyte. It's interesting to see that all of the fastest SSDs rely upon the same controller - the Sandforce 2200 series. Many SSD vendors tweak the firmware to eke out more performance, but they're all very similar under the hood. In the years ahead, I expect SSDs to become cost-competitive with the fastest spinners (traditional magnetic drives) available today. SSD hard drives offer many enticing benefits, with blazing speed and rock-solid reliability at the top of the list. But before you rush out and buy an SSD drive, you should be aware that they're not always the best choice. Depending on your operating system, and how you use your computer, a magnetic drive may be a better choice. 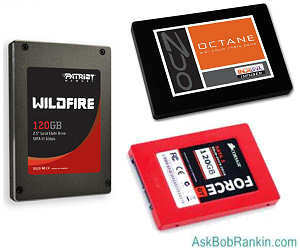 See my related article Solid State Drives: Should You Upgrade? for more advice. Most recent comments on "SSD Hard Drives Offer Blazing Speed"
It's nice to have a fast hard drive. I can't see houw a fast hard drive overcomes the painfully slow Windows 7, though. I got an OWC (Other World Computing) 480 GB SSD. I had received a sale notification from OWC (I have bought quite a bit from them), where I could get the 480 GB SSD for just under $600. I put it in my aging early 2008 MacBook Pro. This was a great replacement for my 300 GB HDD. There are three benefits, increased battery life, lower temperature and speed. I run Windows, Linux, Solaris in VMs under VMWare's Fusion. I do allocate quite a bit (memory and cores) to the VMs (I only run one at a time), so together with OS X, I have a lot of memory swapping going on, which is heavy disk usage. There is also the issue of heat. Now my MacBook Pro runs way cooler and if I'm running on batteries, this further extends the battery life because the fan rarely runs. This was by far the best upgrade I've ever done (I've done a lot of upgrades over the last 20 years of building my own desktop machines starting with my 386 PC). I have a Minibook, Wonder Media 8650. I know this would be considered a 'toy' but it is nice and handy AND as small as my diary; therefore very convenient when travelling light. What I would like to know is: Am I right to assume that it uses an SSD? I cannot hear the spinning sound of a hard drive. Or perhaps, at 75-years of age, my hearing has deteriorated! EDITOR'S NOTE: Yes, this device (like all tablets) does use SSD technology. Perhaps I'm misunderstanding here. You say that SATA III limits to 6GBPS (Gigabytes per second?) and the really fast drives are in the 500MBPS area? That's nowhere near the limit if I'm reading this right. EDITOR'S NOTE: No, it's 6 gigaBITS not gigaBYTES. One byte is eight bits. I have owned an ASUS All Solid-State Drive Laptop since October of 2010 running Windows 7 64-bit! The Boot-Up time in this Baby Is Fabulous and the laptop runs much cooler with the SSD. I would recommend getting at least one SSD for the Operating System. But be forewarned: Third-Party File Erasure programs do not work well in SSD's - - Yet - - but those in the industry are working to find something that will. The software works very well! Bare HDDs have to be partitioned first, then formatted. Windows 7 disk management pretty well takes care of both steps. Are SSDs handled the same way through disk management? EDITOR'S NOTE: Yes, they work the same as magnetic drives, in terms of partitions and formatting. I have several SSD drives but only use them for back-up or storge. How can I persuade an installation to make one behave as an internal C: drive rather than the smaller one in the tower? John. At $1 per Gig, I'll definitely make the move to a SSD when it's time to replace my drive! While it's good that all this is happening, prices are still realistically too high. Most computer users do not really have the need for this technology at those prices, just not feasible. But, like everything else, prices will come down as the technology gets a little older and I look forward to try it out in the future. Thanks for the info and keep up the good work. Ok, so I mistyped, but the point still stands. 500mbps is nowhere near 6gbps; it's only using 1/12 of the available speed unless I'm completely misreading this. Please clarify.